People of different wisdom traditions have recognized that natural spaces can affect their own energy in particular ways. Are you sensitive enough to recognize the subtle changes in energy as you walk from one area to another, such as across a meadow or along a beach? Are you able to identify spots that have healing powers? If not, you can develop this ability by spending more time in nature. 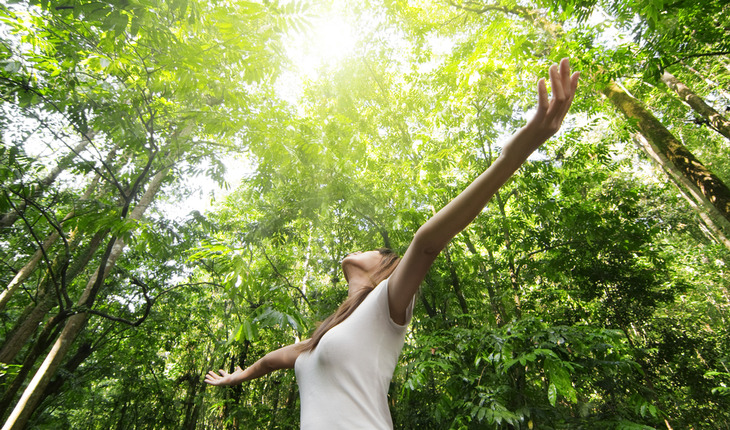 Sensitivity to nature’s healing energy can help you in your quest to achieve well-being. Research shows that time in nature lowers boosts immunity, decreases blood pressure and calms activity in areas the brain associated with stress. Our bodies and spirits seem to thrive on time near bodies of water, under vast skies, and near trees, grass, and brush. Nature is, after all, our home. Nature can bring us back into our bodies and reconnect us with ourselves. We evolved to be outdoors, sharing the planet with plants, insects, and other creatures, with our feet on the earth and our eyes scanning the distance as well as seeing what is right in front of us. When you feel you are overstimulated by all that is happening in your environment and in your mind, take yourself to a forest, a lake, a desert, or somewhere else in nature, and you will probably find it doesn’t take very long to begin to feel a shift in your awareness and mood. Your intuition will start to awaken. Listen to it and let it draw you to those natural spaces where you can engage energy that will balance and refresh you. A shaman can tell you where among the rocks you can go to soak in energy that will replenish you when you are feeling drained and lethargic, or where you can go to more easily release the energies that are weighing you down with worry or grief. Such natural areas can be found all over the earth. You can be your own shaman and find them yourself, allowing nature to guide to where you can experience what you need. You may find that simply being in your back yard, near a public garden, or in a particular spot in a meadow where you feel drawn to sit for a while helps you to reconnect to the balancing, healing energies of nature. Explore natural areas, away from the distractions of everyday modern life and away from the energy fields of electronic equipment that might interfere with your ability to tune into nature’s energies. If you are called to change your plans for the day and go to a nature preserve, it could be because your unconscious mind may know what your conscious mind is denying: that you are in need of connecting to nature’s healing powers. When you return to your routine activities, you may find that you have greater focus, energy and clarity than if you had simply willed yourself to stick with your agenda. Once you are by the roots of a particular tree, or seated in a grassy spot on the riverbank, or in any other natural place that calls to you, listen to your instincts about how you might work with nature. Sit and focus on the experience of the earth underneath you, the wind and sky surrounding you, the sun warming your skin, and the smells of forest, river, meadow or sea entering your nostrils. Allow your senses to fully awaken as you adjust to the music of the space. Focus on the sensations you are experiencing. In this way, you open yourself up to the subtle energies that can infuse you, heal you or wash out of you what is no longer needed. Let nature do what it needs to do to the energy that enlivens your body and causes your cells to reproduce and do the work of keeping you alive. As you stand, sit, or lie in this space, you might like to pray, “Cleanse me, heal me, teach me,” and ask, “What can I do for you?” You might further ask, “What do I need?” The answer may come to you as a word or an image, a sensation, or a sense of knowing what your body and energy field crave and what you need to do. Before ending this experience, you might also ask, “What else do I need to know?” You can even have a conversation with the information that comes to you. Ask it to clarify its messages for you. Before you leave this space, create an intention to follow through with action based on what you learned from connecting to nature. You might take a symbolic action, such as planting a seed in the earth, releasing a leaf into the current of a creek, or skipping a stone into the water, to represent your intention to make a change. Speak whatever words come to you. Perhaps you will realize that this action you’re taking represents bringing something into your life and your story, and getting rid of something, too. Release what is no longer serving you as you open your heart, mind and energy field to what you need. Feel your desire and commitment to make changes rise within you. Soak in the earth’s replenishing energy. Do you sense a need to return to nature and let it heal you? What could you do today to get back to the earth, to observe the movements of fire, to touch water, or to experience your relationship with the wind?